No pasta lasagna, it’s possible and it’s delicious. It’s like a vegetable lasagna gone wild. When you’ve got the best the garden can give you (eggplant, mushroom, zucchini, spinach, onion etc) who needs pasta? Pre-heat oven to 400°F. Coat two baking sheets with spray. Place eggplant on one prepared baking sheet and place zucchini on other prepared baking sheet; spritz vegetables with spray. Roast 8 minutes; turn over vegetables and roast for 7 to 10 minutes more. Meanwhile, in a medium bowl, combine onion, spinach, mushroom, egg, ricotta cheese, red pepper flakes, basil and 1/4 cup Parmesan cheese; set aside. When vegetables are done, reduce oven temperature to 350°F. Assemble lasagna, coat bottom and sides of a 14×8 inch baking dish with spray. Spread a thin layer of sauce on bottom of pan. 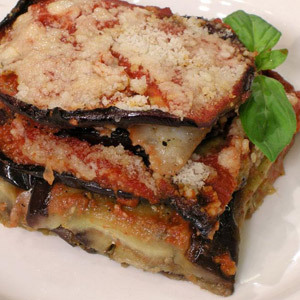 Layer eggplant over sauce (overlap them). Cover eggplant with half of marinara sauce and then spread half of ricotta mixture on top; sprinkle with half of mozzarella cheese. Top mozzarella cheese with zucchini and cover zucchini with remaining marinara sauce; spread with remaining ricotta mixture, top with remaining mozzarella, then sprinkle with remaining Parmesan cheese. Bake until the bottom starts to bubble, about 35 to 40 minutes. Remove lasagna from oven and allow it to rest for about 15 to 20 minutes. This entry was posted in Entrees, Vegetables and tagged easy, eggplant, healthy, healthy tips, italian food, pasta, zucchini by foodies4mmc. Bookmark the permalink.